Transportation for commercial and industrial clients. Schedule your delivery and transport job. In operation since 2005, M3 Transport serves Winnipeg and the surrounding area of Manitoba in all its short distance delivery needs. Our fleet of 14 trucks provides reliable drayage services to and from the Canadian Pacific Railway and Canadian National Railway. 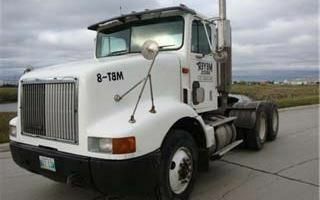 We have a significant bond with Meyer Bros Trucking Ltd, which has been operating within Winnipeg since 1999. The team at M3 Transport stands by our honesty and enthusiastic work ethic. Our drivers are on time for all our services – our drivers are courteous and careful, maintaining a safe work environment as well as a safe city when we travel. A small business run with integrity, we are dedicated to provide you with courteous, professional service because you deserve nothing less. Call our transport team today to get started. Service is available 24/7. Please call for an appointment.